Banjer 37 Motorsailer Club | Home Back to "The Banjer 37"
Here you have the four basic rigs and versions (Lay-outs) of Banjers. I think the Transoceanic was developed in the Stangate Marine period. The figures in Italics are Transoceanic. That means hull numbers 70 or more...... I think owners who increased their sailplan renamed their Banjers also transoceanic. I have a drawing dated 06031974, from Eista werf, for a sail area of 80m2. 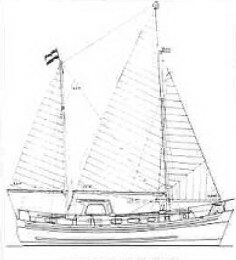 The dimensions measured from the drawing are: Bowsprit 2m; Mainmast: from waterlevel 13,7m; from cabin 11,9m; boom 4,4m; Mizzen: from waterlevel 9,7m; from top wheelhouse 7,2m; boom 3,1m . 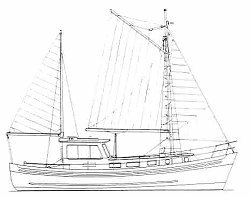 Note: There are also transoceanics with original sail plans of 65m2 and 75m2....."
Brian Hull informs about masts and booms measurements from DUCK SOUP, an A4 Transoceanic, hull 94. 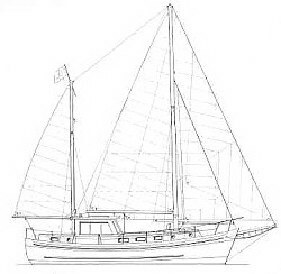 ....MAIN MAST (TOP TO DECK) 11.64M, DIAMETER AT MID LEVEL 54CM..
BOOM 4M, 26.5CM DIAMETER 41CM AT CENTRE. MIZZEN MAST 8.86M TOP TO COCKPIT FLOORBOARDS. DIAMETER AT MID LEVEL 41.2CM..
(To know more about this magnificent example of a Banjer Transoceanic, visit its dedicated page. More info on Transoceanics from Deees de Smet, who owns KITTYHAWK, an A3 Transoceanic, from 1974. - Extra ballast placed under the starboard and under the backboard bunks(Seats) and covered with polyester. mizzen mast profil p9 , 8.20 meters. Mizzen boom profil P5 , 3.10 meters. 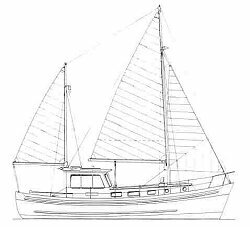 - Lenght of bowsprit 1.35 meters.The bowsprit is made of strong stainless steel pipes . - The deck MUST be reinforced. A strong pillar must be placed under the deck to support the mast. The deck will otherwise be pressed a few centimeters and cracks will show! See the fotos on the banjersite..
- Enginer 4 cyl. Perkins 81 HP. 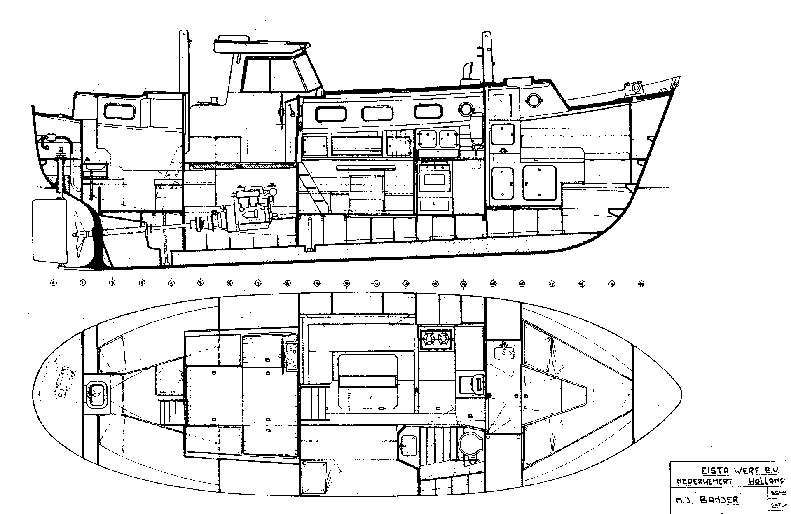 - The engineroom is smaller than the non transoceanic version ,because of the large fueltanks. - Do not forget : Larger masts need a bow truster, prefereably a strong one.